Become a fan of BodyResults.com on Facebook. Get updates, participate in discussions and share with your friends. Go now. The wake-up call rang in my motel room in Loveland, Colorado at 11 PM – a seemingly odd time to get out of bed and make a final check of my backpack and gear. I tried to eat something as I packed up, but excitement dampened my appetite. 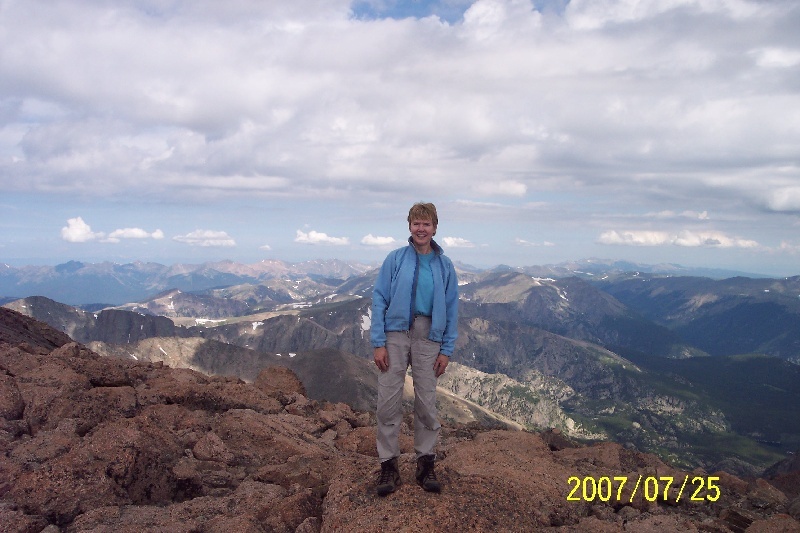 I had longed for this trip, longed for this peak – Longs Peak, 14,259 feet – one of Colorado’s most famous fourteeners, the highest point in Rocky Mountain National Park, and a challenging climb, no matter which way you go. 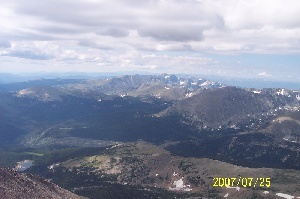 Longs Peak was not so much on my “to do” list of mountains as it was on my “must do” list. My husband, Bob, could snooze in a few extra minutes before helping me load up and then drive me to Estes Park for the 1 AM rendezvous with the Colorado Mountain School guide who would lead me up the North Face. Why such an early start? The Rockies are notorious for their fierce afternoon thunderstorms in the summer, and the earlier you set out, the better your chances of summiting before noon. As I settled into the car, I thought back over the months of training for the day ahead. Like going to take a final exam, I had to believe I had done all the preparation necessary to make the grade – the steep grade up Longs. Arriving at Colorado Mountain School, I met Mike, an experienced guide who had guided on a number of mountains in the state. We reached the parking lot at the foot of the Longs Peak Trail – elevation 9,405 feet – at about 1:30 on the morning of July 25, 2007. The temperature was pleasant – a light jacket would be enough to start. Mike asked how much water I had. When I pointed to the Camelback and copious bottles of water and electrolyte-infused drinks, he advised me to dump some of my load since we would be able to purify water at the Boulder Field. Headlamps on, we started up the trail at 1:40. We were not alone, for Longs is a popular peak. We followed the trail through forest and across streams. The climb was steady, and 4.2 miles later, we were above the tree line at Granite Pass, 12,000 feet. By then, my heart was pumping well. It was a clear night, illuminated by stars and small bunches of bobbing headlamps. I began feeling cold and stopped to put on a fleece jacket as the wind picked up. “That’s the katabatic effect,” Mike explained – a chilling wind that falls down slope from a higher elevation. We continued hiking and Mike decided to let me set the pace. I took that as a good sign that I didn’t need prodding. My training for this climb had been multi-faceted. I had climbed mountains ranging from 10,000 to 13,000-plus feet in altitude since late May almost weekly, sometimes summiting on two days in one week. I ran four times per week, doing intervals on two of the days. I also kept up my weight training and did yoga for flexibility. And there were also workouts at the climbing gym. All in all, a pretty balanced program that I felt had worked for me as I kept up a steady pace. After climbing switchbacks for about two more miles, we reached the Boulder Field at the12,600-foot level, just below the North Face. The name fits the place well – a field of boulders on which feet and legs totter after the trudge up the trail. We purified spring water and filled our Camelbacks and enjoyed a leisurely break. 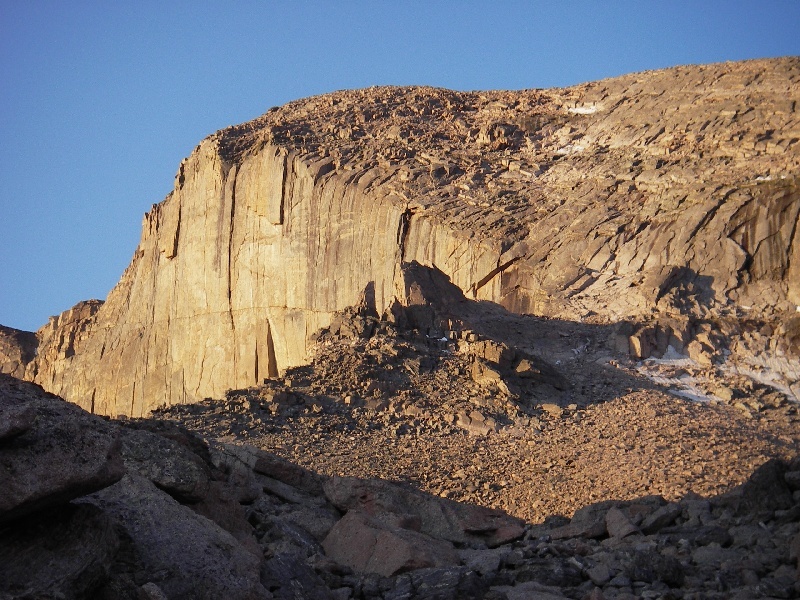 The massive monolith of Longs Peak took shape as the sky began to lighten and I stood face to face with the realization I was –yes – finally going to climb this mountain. The North Face was formerly known as the Cable Route. In the 1920s, the National Park Service installed steel cables up the face to enable people to reach the summit. But, in 1973, the Park Service removed the cables, although the bolts still remain. In an area known for its violent lightning and thunderstorms, it’s surprising that park officials put up the cables for climbers. 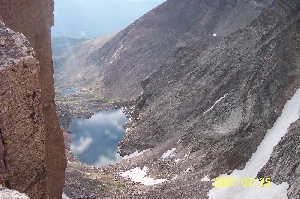 Mike and I scrambled up to the flats at the head of the Boulder Field and headed east to a notch in the ridge, a point known as Chasm View, at 13,490 feet. Fortunately, there’s a rock slab that I braced myself against while I gazed about 1,700 feet down on Chasm Lake, situated at the base of the East Face of Longs. Then, my eyes swept up the precipitous East Face that attracts big-wall climbers for a true test of skill and nerve. As a person who usually enjoys a plunging overlook, this vertiginous view reminded me to keep a healthy respect for the force of gravity. The surprise was mine. Nine-fifteen and I was on top. Bob – by now on the golf course in Estes Park – congratulated me when I called him on my cell phone to tell him that I had reached the summit so much earlier than I had expected. I felt remarkably well and strong, yet almost overwhelmed. The summit is a flat four acres of boulders from which you can look and see mountain ranges beyond mountain ranges for 360 degrees. Colo-rocky-rado!! I don’t really remember what I said when I reached the summit, but I would guess that it was probably just a simple “WOW!” Mike had done a great job of guiding me safely to my longed-for summit. We took time for a brunch break, I signed the summit register, and savored the time on top. We left the summit, rappelled back down the North Face, wove our way across wobbly boulders, and hiked back to reach the parking lot at 4:15 that afternoon. Successful – and memorable – climb!